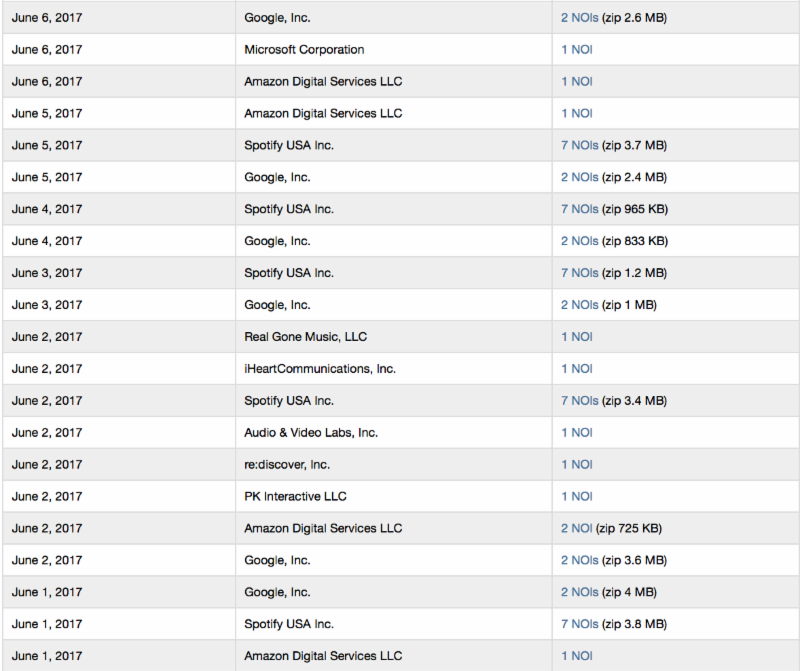 As we have reported a number of times this year, Amazon, Spotify, Google, Pandora, iHeart, Loudr and others are taking advantage of the compulsory license loophole that allows these companies to file tens of millions of address unknown “notices of intention” to rely on the compulsory license for songs in the Copyright Act. Perhaps more remarkable is that Amazon’s head of music, the eponymous Steve Boom, managed to make it through his entire Alexa demo at the NMPA Annual Meeting keynote without ever mentioning Amazon’s dedication to the mass NOI loophole and its negative effects for the songwriters and publishers listening to his demo. 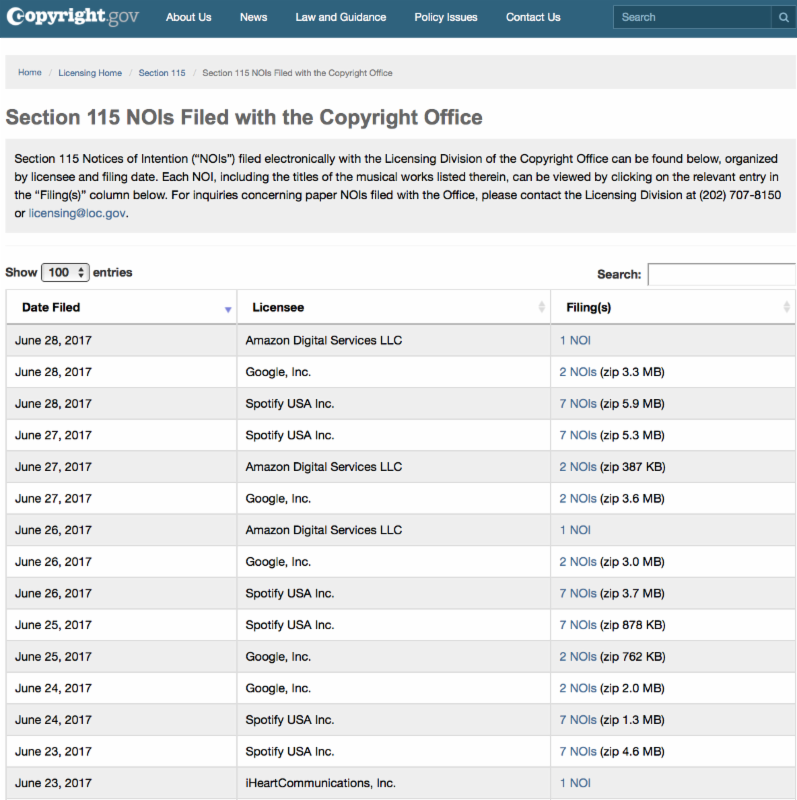 If a music user like Amazon wants to use the song compulsory license but can’t find the song owner in the public records of the Copyright Office (often the case for ex-US songwriters), a loophole from 1976 allows the user to file the required notification (often called an “NOI”) with the Copyright Office instead of with the song copyright owner. Assuming the filing was made correctly, the user can then allege that the user is entitled to all of the benefits of the compulsory license without the obligation to pay royalties until the song owner catches them. This problem exists for ex-US songwriters, catalogs registered before 1978 and for any newly released song due to the Copyright Office’s self-imposed delay in processing registrations. While the Copyright Office seems to be very interested in making sure these mass NOIs go through the bureaucracy quickly, they have no demonstrable interest in doing the same with new copyright registrations that can languish for six to ten months for digital registrations and over a year for paper. What’s the total damage? As of January Rightscorp estimated there were over 30 million “address unknown” NOIs, and I would project that number could easily have doubled since then. Why that increase? Mr. Boom might have enlightened us, but since he didn’t, we can make some educated guesses–starting with because songwriters let them get away with it. 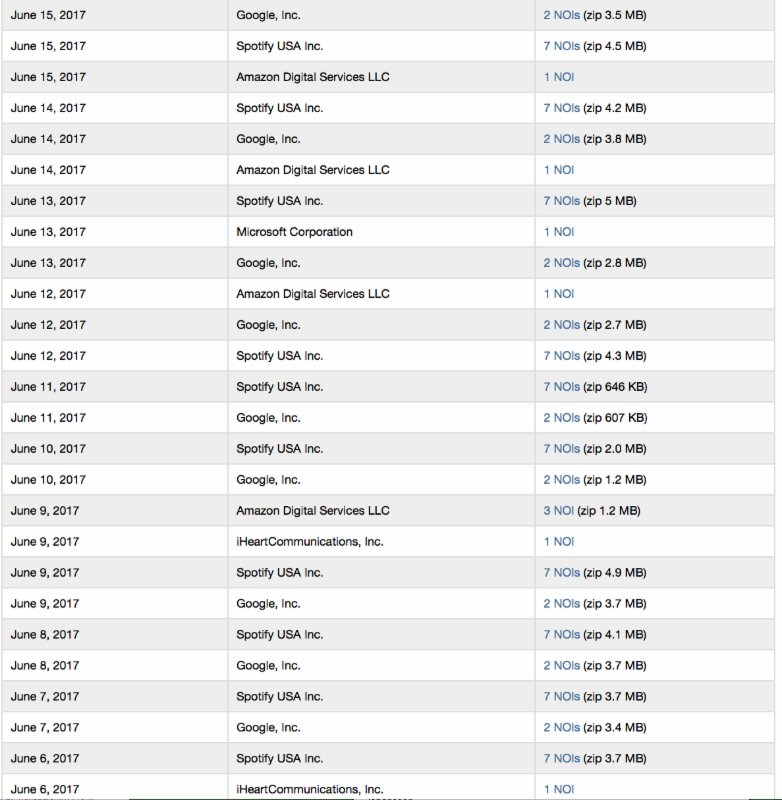 97 of these filings were made by the biggest “data lords” in the world in June alone–and remember that each filing can include multiple compressed Excel spreadsheets that contain multiple worksheets that themselves include tens of thousands of songs for the bigger services. And also remember that in order for a songwriter to find out if their song has been used, there is no searchable database made available by the Copyright Office, leaving anyone unable to search for a handful of titles without reindexing all the filings. It is confusing at best to post the NOIs the way the Copyright Office has chosen to make them available. 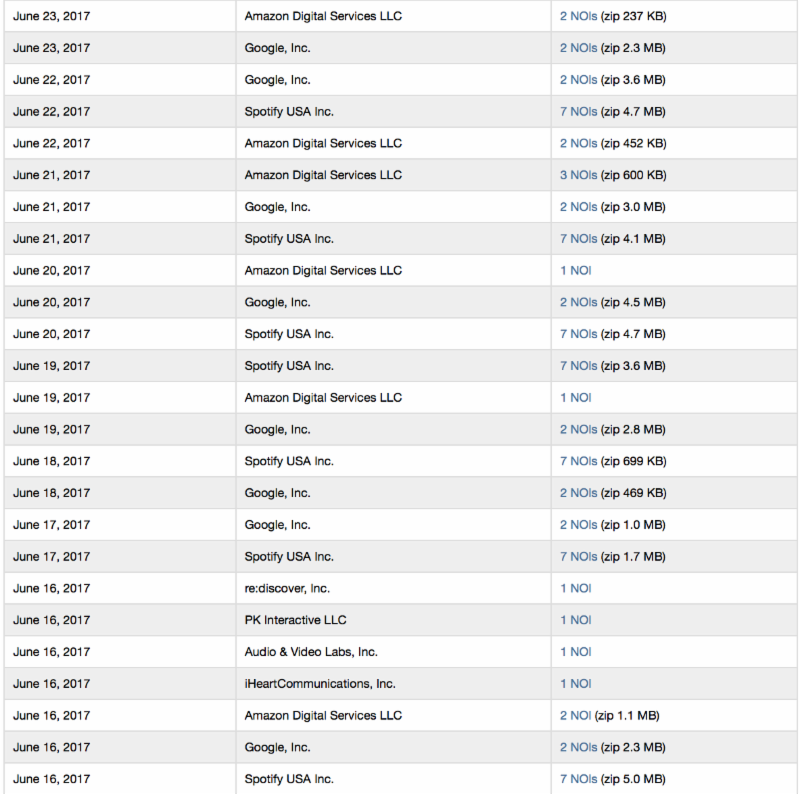 For example, it looks like Amazon filed one NOI on June 28–when in fact it is a much larger filing if you can ever get the file attachment to decompress. Needless to say, it is very difficult for any individual songwriter to somehow manage to search these data. This is the point of the NOIs being filed at scale–while they need to be made available to the general public if the Copyright Office files them in a manner that is unusable by even large music publishers, it’s almost like not filing them at all. So far, the Copyright Office has yet to respond to the requests of songwriters seeking to post the NOIs in a usable manner. I’ve offered a few suggestions for actions by the Copyright Office in a Huffington Post piece, and also an article for the current issue of the American Bar Association Entertainment & Sports Lawyer. We, RoyaltyClaim.com, are launching a searchable database next month at the Music Industry Research Association’s MIRA Conference. We not only have NOIs, but also unclaimed royalty records and music licenses records from several other music rights organizations. I demoed the platform last month at the SoCal Music Industry Professionals and Artists Managers Connect meetup in Downtown Los Angeles. Learn more at http://www.royaltyclaim.com. Also, TuneRegistry addresses the issue before it becomes an issue. Learn more at wwe.tuneregistry.com. So the only thing we as songwriters can do is to make sure our current address is on file with the copy write office? You may wish to try calling the Copyright Office’s Information Section of the Licensing Division at (202) 707-8150 or licensing@loc.gov.